Warning: Spoilers for the beginning books may appear. Anyone else relate to the Castle gif? I'm pretty sure that everyone who finished this newest installment in The Lunar Chronicles world reacted similarly to this. It's not as if I thought I would come out of this sympathizing with Levana or liking her a little bit more. But usually when you read a villain's backstory, there's somewhat of a bond that's created between the reader and the villain. And I love villain backstories. Reading about the villain and seeing the factors that led them to them, it's something I wish more authors did. This was on a whole other level. The Castle gif accurately pictures my reaction because once I finished, I didn't know what to say or do. How do you describe the level of disturbing creepiness that I read? Horrifying, disturbing, sick, twisted...pick your word, any word. Levana grew up in a lonely, loveless family. We don't meet her parents because they just died, but we understand that there was no sadness felt after their deaths. From reading the other books in the series, we know how important Channary and one particular actions of hers will be, so I was expecting something better from her. Either I missed a clue in the other books or I was just naive, because she was possibly even worse than Levana. At first I really did feel sorry for Levana. She was disfigured for a reason we don't know yet and horribly treated by her sadistic sister. She's craving love and attention. That feeling of pity and sympathy quickly vanished and turned into horror when the story progressed. Because of her loveless childhood, she set her sights on an older man, who was one of the royal guards. Attractive and nice, Evret, the royal guard, stood out from the rest. Hey, that's normal for young girls. But considering that it's Levana we're talking about, I wanted to scream RUN, MAN, RUN when we were first introduced. I wished we had seen a better insight to the Lunar world because I still felt like we had snippets here and there. The whole world is fascinating and Marissa Meyer has done a great job with it, I just wish we would experience it more. We still have hope for Winter, which this novella also did a good job in setting up. I loved reading about Winter in Cress and even more so in Fairest, although I realized how sad it is that I knew how most of her childhood would be like. In the last part of the book, more politics are involved, and Levana's hunger for power is increased to the max. Again: creepy. Now that we have more information for Levana's character and her history, we know that there will be no redemption for her. No soft spot for anything, no moment of weakness. I want to say that she only loves herself, but that's not entirely true either. Levana looks out for herself because no one else ever has and in a way, maybe that means she loves herself. But we know that she always hated her looks and conflicted in her feelings. She's selfish, and I think it's interesting to realize that that doesn't equal loving herself. 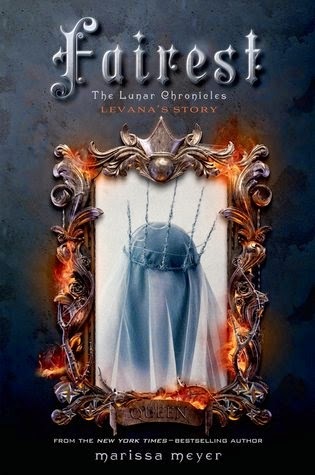 I think I'll be a big ball of anxious nerves in Winter because Levana will give it her all to win over the heroes. But reading Fairest also makes me very excited to read the finale of this series. Each book in the series (besides this one) has increased in page count, so we know Winter will be the largest. I have hopes it'll be the most amazing one of all too. As for Fairest and all of Levana's cringeworthy actions and Channary's sadistic character? It isn't necessary to read this, but I recommend doing so because you get more information and backstory. How do you like reading about the backstories of antagonists? Haha, I feel like the only person who hasn't been terrified/horrified by Levana. She scored maybe a 4/10 on my villain scale. :( But I agree with you; I'm definitely hoping to see more of the Lunar world in Winter since we only got small tastes of it in Fairest. Wonderful review, girl! Your last paragraph is spot on - she's a selfish character, and so so disturbing... yet you can't say she loves herself because she's so clearly disgusted, too. Marissa has done a fantastic job with her character.